Puzzled. That best describes my reaction on entering the Target Center to watch the Minnesota Timberwolves and instead finding the Muskies. Did I miss something? Am I at the right stadium? Turns out, tonight was the first night the Timberwolves are wearing throwback jerseys of the Minnesota Muskies, to honor a basketball team from Minnesota’s past (1967-68). This photo captured a Minnesota three-pointer, though the Pacers would win 109-99. Thanks Target for the suite seats. 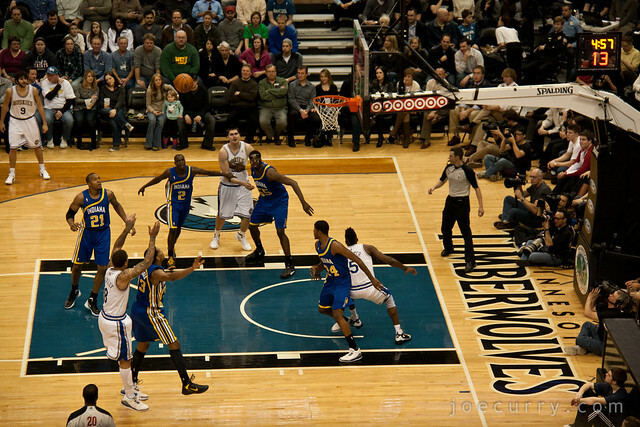 This entry was posted in Minneapolis, People and tagged minnesota, sports by Joe Curry. Bookmark the permalink.